This volume starts out with another battle against the Frightful Four, with more clues dropped about the mysterious background of Medusa. Following that, we get the wedding of Reed Richards and Susan Storm in Annual #3. This issue features cameos by most of the Marvel Universe, as the other heroes such as the Avengers, Spider-Man and the X-Men work to keep the villains from disrupting the ceremony. While on their honeymoon, the Fantastic Four are led to the Hidden Land, where we meet Black Bolt, Gorgon, and the rest of the Inhumans living in Atilan. The Inhumans are a race of people that have been exposed to the Terrigen Mists, which mutates their bodies to give them some incredible power. Johnny Storm falls in love with Crystal, one of the Inhumans and the younger sister of Medusa. Over the next few years, Johnny and Crystal’s story would loosely echo that of Romeo and Juliet, as two lovers who cannot be together due to their respective families. Following their return to New York City, the Fantastic Four faces their greatest threat to date, as they encounter the Silver Surfer, a cosmic-powered herald for the world-consuming Galactus. With the help of the Watcher, the Fantastic Four overcomes Galactus and saves the planet, but at the cost of the Silver Surfer being banished to Earth. The remainder of this volume includes the introduction of the Black Panther, a prince from the African nation of Wakanda and considered to be the first black superhero in mainstream American comics. We see Johnny enroll in college, where he meets Wyatt Wingfoot, an American Indian who would be a loyal friend to the Fantastic Four for many years. The stories revisit the Inhumans often, and we see the Silver Surfer try to adapt to his new home. And no volume of the Fantastic Four would be complete without an appearance by Dr. Doom. What makes this Essential? : This is THE volume to have in the Essential Fantastic Four. These stories reflect Lee & Kirby at their collaborative creative peak on the title. You cannot read these comics and not get caught up in excitement and energy coming off of the pages. And while I remain an advocate for the Black & White collections, I could make the argument that these stories should be read in color — via the original issues, the Marvel Masterworks collections, or the Fantastic Four Omnibus collections. During this time period, Kirby started using illustrated collages with images to visually depict the cosmic scope of the situation. For example, see Fantastic Four #48, page 19, where we see Galactus’ ship opening up, or Fantastic Four #62, pages 4 and 5, where we see a two-page spread of the Negative Zone. The reprint quality of these pages in the Essential volume is rather poor, and you would be better off reading these in color. Footnotes: The two annuals provided Lee & Kirby the chance to bring in some familiar characters. With Annual #3, two of the guests attending the wedding were Patsy Walker and Hedy Wolfe, stars in their own right from various girl comics and romance comics of the 1940s & 1950s. This was the first time that these characters appeared in a Marvel Universe comic. While the character of Hedy has been pushed to the sidelines as a reference character, Patsy Walker has enjoyed a long life in Marvel Comics, becoming the Hellcat in the pages of the Avengers and by being part of the Defenders for many years. In Annual #4, Lee & Kirby brought in the original Golden Age Human Torch (Jim Hammond), and his creator, Phineas T. Horton. Both had been dormant characters for the previous decade. With their re-introduction into the Marvel Universe, both would be revisited in the years to come. If you like this volume: take a look at the Kirby4Heroes Campaign, which raises funds for the Hero Initiative. Organized by Jack Kirby’s granddaughter, Kirby4Heroes was established to honor the legacy of Jack Kirby by giving back to the comics industry. On the Kirby4Heroes Facebook page (https://www.facebook.com/kirby4heroes), Jillian Kirby spotlights her grandfather’s artwork from all eras of his long career and encourages events each August to celebrate Jack Kirby’s birthday. The Hero Initiative is the first federally recognized not-for-profit that creates a financial safety net for comic creators who may need emergency medical aid, financial support for essentials of life, and an avenue back into paying work. The Hero Initiative has raised funds to provide needed support to over 50 creators in times of need. Along with my friends, I have volunteered many hours over the last 10 years at local comic book conventions working a table for the Hero Initiative, raising funds and public awareness. For more information, visit www.heroinitiative.org and consider making a donation today. This entry was posted in Fantastic Four, Marvel Essentials and tagged Fantastic Four, Jack Kirby, Stan Lee. Bookmark the permalink. 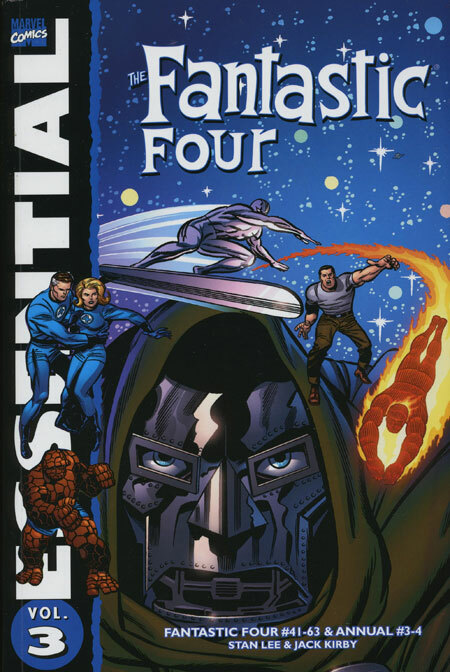 Pingback: Kirby Week 2015 – Essential Fantastic Four Vol. 3 | WORST. COMIC. PODCAST. EVER!